Skip Raymo puts the finishing touches on one of his creations. Photos by Cory Godwin Productions. Skip Raymo stands on the side of Carotoke Highway in Barco covered from head to toe in a thin layer of sawdust. It’s only 10 a.m. and the sawdust is already in his eyelashes and hair, in his ears and even under his fingernails. There are small piles of it at the bottom of his shoes, despite the handmade gators he wears to keep it out. Wherever he steps, Raymo leaves a dusty boot print behind him. Not far away, a sprawling pile of pine logs, chunks of poplar and tools sit under a tent on the edge of U.S. 158, one of only two roads that lead to the Outer Banks. Raymo used to be an electrician – for 15 years to be exact. 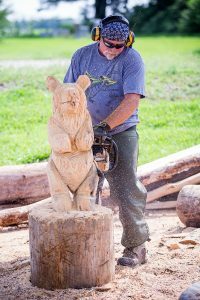 But his life took a slight turn about eight years ago when he found a book his brother left during a visit called The Art of Chainsaw Carving. It had been lying dormant under his couch for several years. The book stirred something that obviously had been dormant in Raymo as well. After flipping through some pages, Raymo revved up the old chainsaw, started messing around with some pieces of wood and watched a few YouTube videos. It wasn’t long before he started turning logs into art. 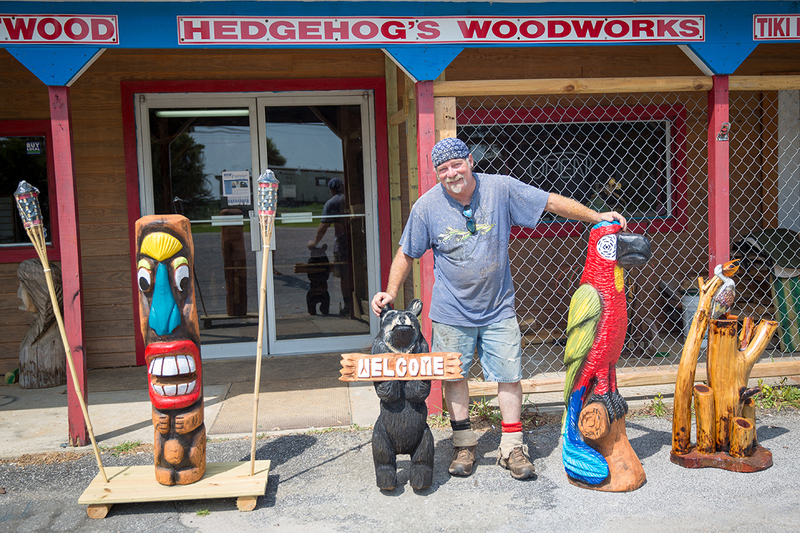 The storefront of Hedgehog’s Woodworks in Barco. 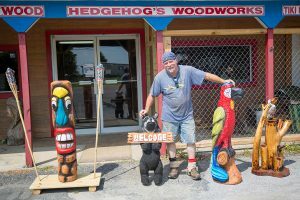 So Raymo began investing in some tools of the trade, including some grinders and a Fordham carver, a tool he describes as a “Dremel on steroids.” He took up shop in the building adjacent to Currituck Sports and has put a name to his business – Hedgehog’s Woodworks. And his business, along with the pieces of pine he gets free of charge from Rainwater Tree and Lawn Service, began to take shape. Now he can hardly keep up with the demand. His best sellers that move through the store quickly, particularly on summer weekends, are the two- to three-foot carvings of everything from bears holding welcome signs and fishing poles to herons and pelicans. It’s what he calls the “cash and carry” items that people can buy on a whim, put in their car and drive away with. They sell for between $150 and $200. “I can’t seem to make them fast enough,” he says. But it’s the custom work he really enjoys, which can take him up to two weeks to complete. Raymo’s work can be found displayed around the region. 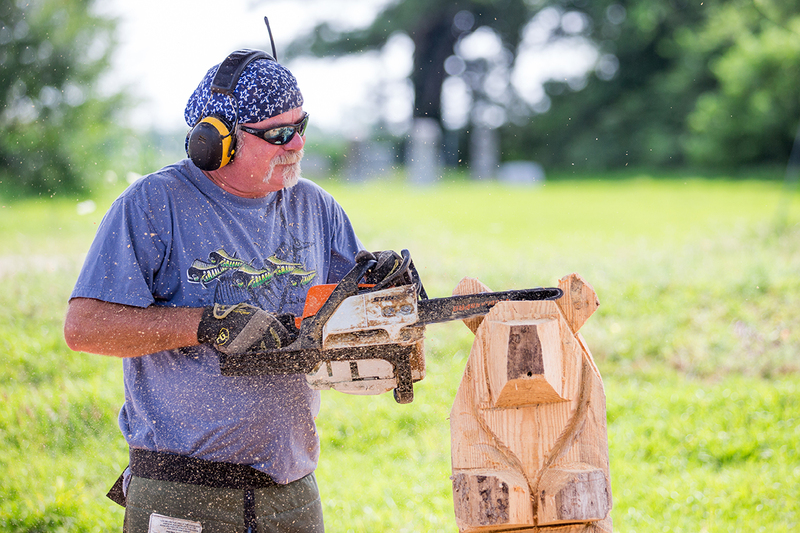 A perched eagle that towers outside Outer Banks Harley Davidson is his creation, as well as the Dennis Anderson “Grave Digger” that greets passersby outside Digger’s Dungeon. His carving of a 12-foot bear stands at the Dismal Swamp Wildlife Refuge Welcome Center. Using mostly pine, Raymo also works with poplar and hickory logs as well. And whatever he brings to life from the wood, the people who bring them home always name their wooden creations. But whether he’s carving away at a custom order of the Loch Ness for the N.C. Aquarium or making dozens of pumpkins to keep up with the demand for them at Morris Farm Market during the fall, Raymo says there’s something therapeutic about taking a chainsaw to a piece of wood and making it into something. Skip Raymo carves out a bear on the side of Caratoke Highway in Barco. Raymo is busy year round at his roadside art studio and it doesn’t matter what the weather is. He carves in the heat, the wind, the snow and the rain. And it keeps him busy even in the dead of winter, when he makes seasonal carvings such as Santa Clauses and Christmas trees. “I remember one year I made a 19-piece holiday set for an oncologist in Maryland,” says Raymo. Raymo laughs when people ask him if he advertises. He also adds that he sees some crazy sights working on the side of Caratoke Highway – everything from car accidents to black bears. “It’s a wild spot,” Raymo says. Hedgehog’s is hard to miss, with eye-catching life size carvings of all kinds outside the store. Right next to Currituck Sports, which has been at that location for more than 50 years, the lot is a popular one among Currituck County’s “good ole boys” who go to Currituck Sports to buy bait and other supplies while swapping stories. And now that Raymo is carving out his niche next door, another piece of the local character is laying down its roots in Barco.